Matt Bryant made two of his four field goals in the fourth quarter and the Falcons stayed perfect with a 19-13 victory over the Cowboys on Sunday night. Matt Ryan completed 24-of-34 passes for 342 yards and ended with a passer rating of 102.8 for the Falcons (8-0), who improved to 29-0 when Ryan hits the century mark in quarterback rating. Michael Turner carried the ball 20 times for 102 yards and a touchdown for Atlanta, which will play at New Orleans next Sunday. Julio Jones caught five passes for 129 yards and Roddy White hauled in seven passes for 118 yards. Tony Romo connected on 25-of-35 passes for 321 yards and a touchdown for the Cowboys (3-5), who have lost two in a row and four of five. Kevin Ogletree caught three passes for 96 yards and a score. Jason Witten became the most prolific pass-catcher in Cowboys history with seven catches on Sunday. He surpassed Hall of Famer Michael Irvin, who had 750 catches from 1988-99. Witten now has 754 career catches. With the score tied at six, Turner ripped off a 43-yard run late in the third quarter. White caught an 8-yard pass on the first play of the fourth period to move the ball to the 3-yard line. Turner found the end zone from there to give the Falcons a 13-6 lead. 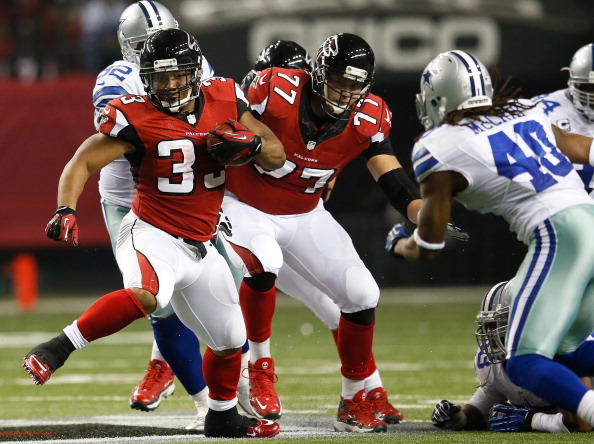 Atlanta extended its margin after Dallas went three-and-out. Jones’ 48-yard catch-and-run put the ball at the 35 of the Cowboys. On 3rd-and-1, Jones lined up in the backfield and ran for eight yards. However, the Falcons had to settle for a 36-yard Bryant field goal with 7:49 to play. Dallas quickly responded with a touchdown to make things interesting. Romo rolled to his right and found Ogletree in the end zone for a 21-yard score, cutting the gap to 16-13. The Falcons were able to convert some key third downs on their ensuing possession. On 3rd-and-6 from the Atlanta 24, Jacquizz Rodgers recorded a 31- yard catch-and-run after breaking an arm tackle from Orlando Scandrick. The Falcons converted their next third down when Scandrick was called for holding. Rodgers made two defenders miss on an 11-yard catch on 3rd-and-5. The home team finally had to settle for a 32-yard Bryant field goal, which made it 19-13 with 17 seconds remaining. Atlanta’s defense held in the final seconds, keeping the Falcons as the lone unbeaten team in the NFL. The Cowboys’ first possession of the game started at the Atlanta 32-yard following a 37-yard punt return from Dwayne Harris. Dallas moved the ball to the five, but Romo’s pass fell incomplete on third down. Dan Bailey made a 23- yard field goal to make it 3-0. 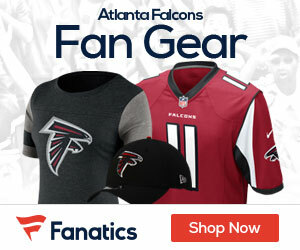 The Falcons moved the ball to the Dallas 18-yard line on their ensuing possession, thanks to a 38-yard catch by Jones. However, the Cowboys held strong on defense and stopped Rodgers on 3rd-and-2. Bryant pushed a 37- yard field goal wide right. Dallas tacked on three more points when Bailey made a 32-yard field goal with 3:42 left. Ogletree’s 65-yard catch on 3rd-and-20 made Bailey’s field goal possible. Atlanta bridged the first and second quarters with an 8-play, 46-yard drive. White caught an 18-yard pass on 3rd-and-7 from midfield. The Falcons failed to convert on their next third down, leading to a 45-yard Bryant field goal. Falcons cornerback Dunta Robinson was called for a pair of penalties on Dallas’ ensuing possession. The second penalty on Robinson took an interception away from Thomas DeCoud. The Cowboys got to the 36-yard line before sending Bailey onto the field, but he missed a 54-yarder. Following a punt from each team, Atlanta took over at its own 12 with 1:03 to go. After White caught a 20-yard pass on third down, Tony Gonzalez hauled in passes of 12 and 15 yards. Bryant made a 46-yard field goal as time expired to make it 6-6 at the half. Bryant missed a 43-yard field goal early in the third stanza.